NGC 3603 is a starburst region : a cosmic factory where stars form frantically from the nebula’s extended clouds of gas and dust. 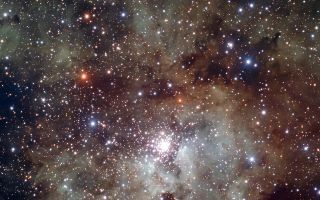 NGC 3603 is a starburst region, which is a cosmic factory where stars form frantically from the nebula’s extended clouds of gas and dust as seen in this cool space wallpaper. Located 22,000 light-years away from the Sun, it is the closest region of this kind known in our galaxy, providing astronomers with a local test bed for studying the intense star formation processes, very common in other galaxies, but hard to observe in detail because of their large distance.